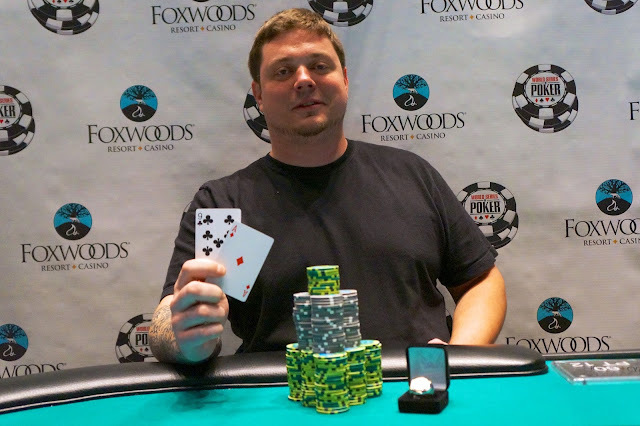 Congratulations to Jason Strasser, winner of the Foxwoods Circuit Main Event. For his victory, Strasser takes home $186,600, the Circuit Main Event Ring and a seat to the WSOP National Championship. Foxwoods WSOP Circuit Main Event is Heads-up and Streaming Live! We are down to the final two players in the Foxwoods Circuit Main Event. Second place will take home $115,069 while first gets $186,600 as well as the Circuit Ring and a seat to the WSOP Championship. You can watch the live stream of the heads-up action by clicking on FoxwoodsLive.com. We are down to the final four players in the Foxwoods WSOP Circuit Main Event. Keep up with the live updates on the official WSOP website by clicking here. We had a total of 207 players in Event 12, the $365 No-Limit Hold 'em, creating a prize pool of $62,245. We have reached the final table of the Foxwoods Circuit Main Event. Day 3 of the Foxwoods Main Event is Now Streaming Live! Day 3 of the Foxwoods Main Event is now underway. The blinds are currently 12,000-24,000 with a 4,000 ante. The Final Day of Play at the Foxwoods WSOP Circuit is a Busy One! This is it. 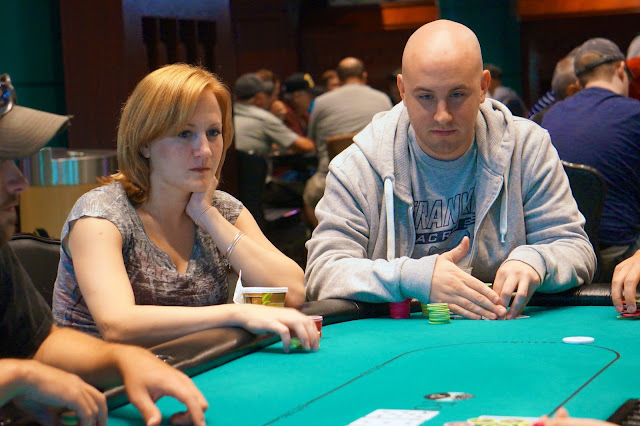 The final day of play is underway at the Foxwoods Circuit Series. But oh my, what a day it is. One new event, two events returning and three Circuit Rings to be awarded today. First, Event 12, the $365 No-Limit Hold 'em Turbo, is now underway. Player start with 10,000 in chips and the levels are 20 minutes in length. This event will end today. Day 2 of Event 11, the $365 No-Limit Hold 'em, resumes at 1pm today. Joe Frizzi leads the field with 510,000. Everyone will be looking for the $19,523 first place prize and the eleventh Circuit Ring of the series. Finally, the Foxwoods Main Event resumes at noon with 11 players remaining. First place will pay $188,600 and the Circuit Main Event Ring. Wes Wyvill leads the field with 2,741,000. The Money Bubble Bursts in the Foxwoods WSOP Main Event! 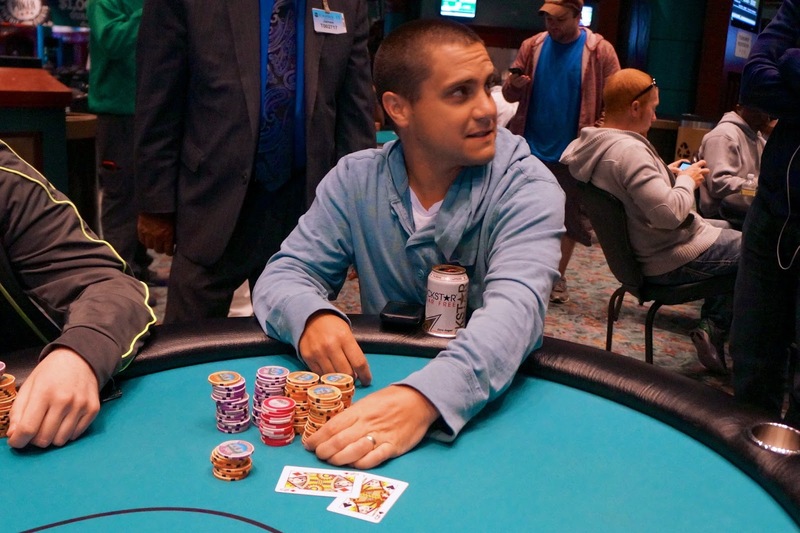 Dave Stefanski doubles up on the money bubble with quad queens. 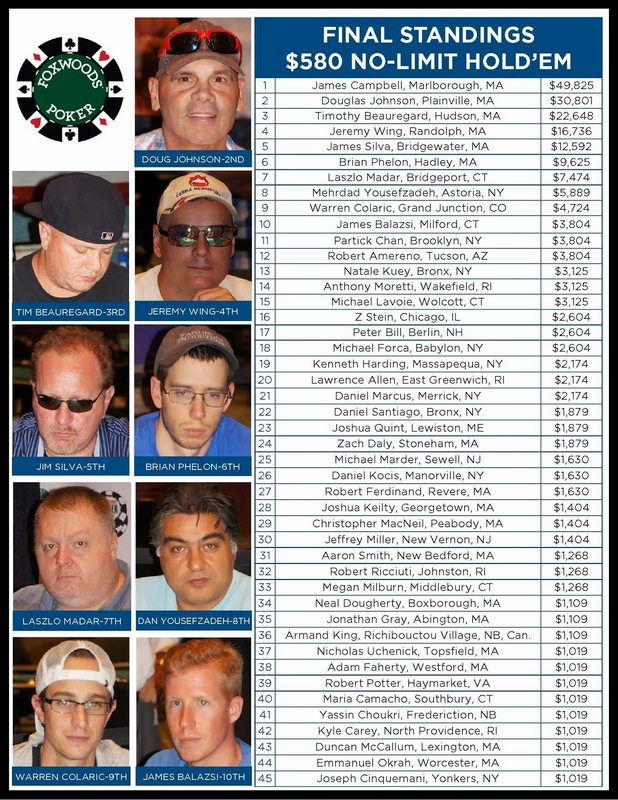 We are down to the final 63 players and in the money in the Foxwoods Circuit Main Event. Follow along with all of the live updates on the official WSOP website by clicking here. 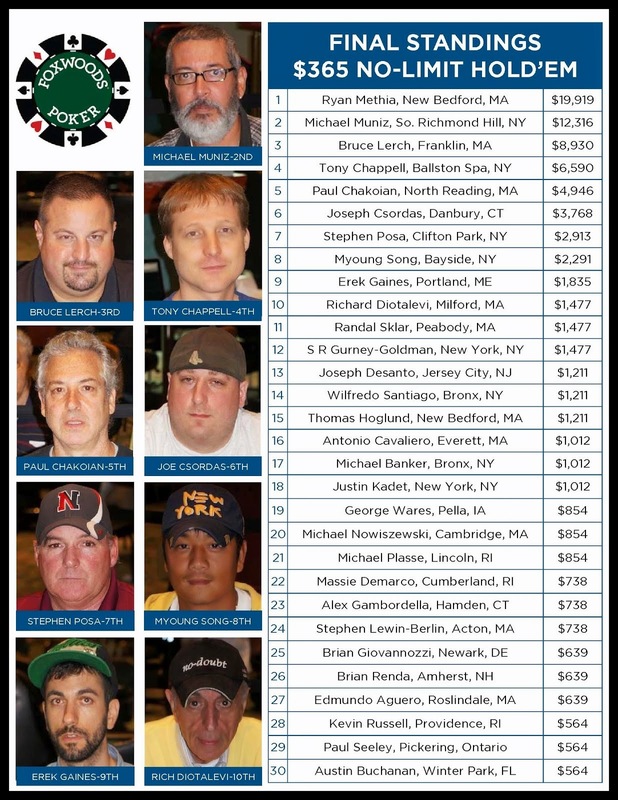 We had a total of 265 players in Event 11, the $365 No-Limit Hold 'em, at the Foxwoods Circuit Series. 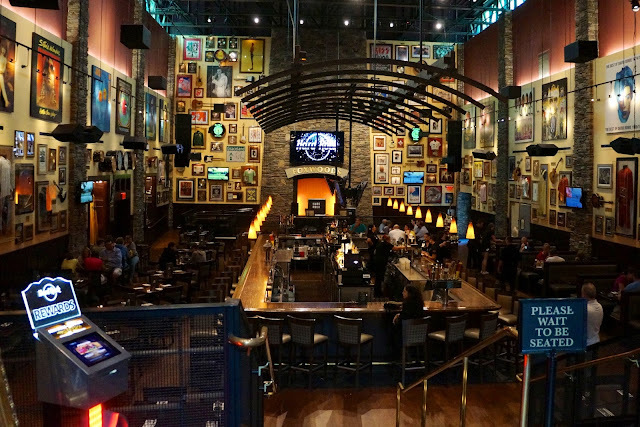 Follow the WSOP Live Updates from the Foxwoods Circuit Main Event! 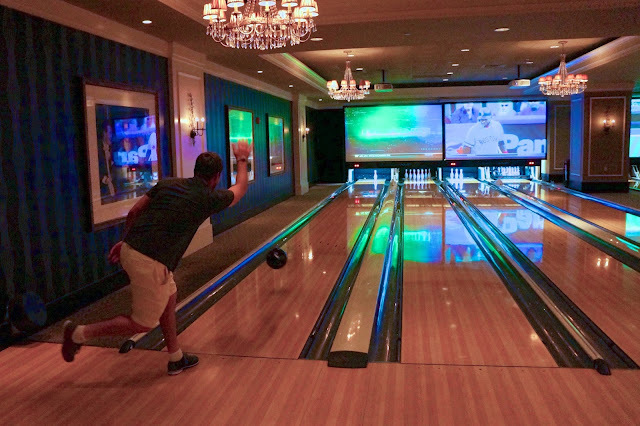 Looking for live updates from the Foxwoods Circuit Main Event? Be sure to visit the official WSOP website to follow along with all of the action. You can follow the Day 2 live updates by clicking here. 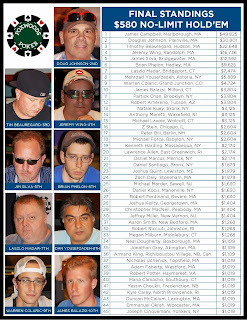 Final numbers are in and the grand total for the Foxwoods Circuit Main Event is 591 players. This created a prize pool of $888,568. The final 63 spots will will finish in the money with first place taking home $186,600 and the Circuit Main Event Ring. Day 2 of the @WSOP Circuit Main Event Now Streaming Live! Day 2 of the Foxwoods Circuit Main Event is now underway. The blinds are currently 800-1,600 with a 200 ante. Follow all of the live updates from Day 2 on the official WSOP website by clicking here. 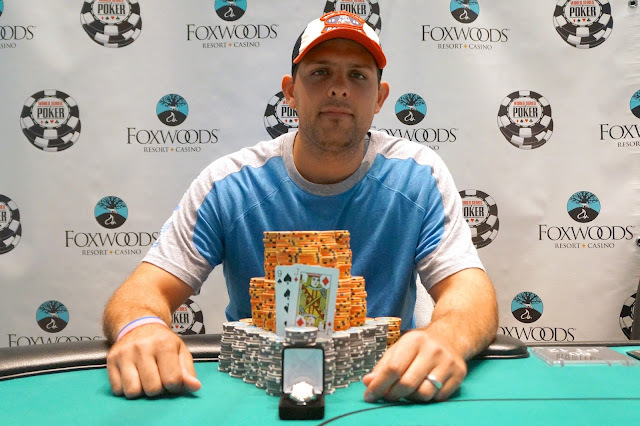 Play has come to an end on Day 1 of the Foxwoods Circuit Main Event. With registration still open until play begins, final numbers and payouts will be posted tomorrow. Stay tuned to FoxwoodsPoker.com for the Day 2 chip counts and seating assignments as soon as they are made available. Keep up with Flight B of the WSOP Circuit Event with their live updates! 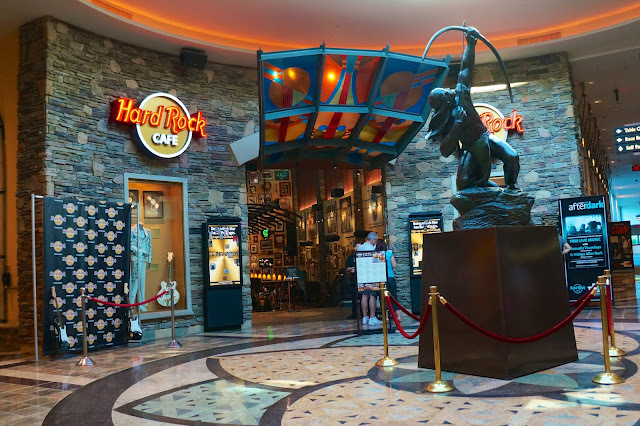 You can keep up with all of the action from Flight B of the Foxwoods Circuit Main Event by going to the official WSOP Live Updates page here. Flight B of the Foxwoods Circuit Main Event is Underway! Flight B of the Foxwoods Circuit Main Event is now underway. Players start with 20,000 in chips with the blinds at 25-50 for 40 minutes. Players will play ten levels today and those that survive will advance to Day 2 tomorrow at noon. You can still watch the live stream of the Flight A feature table by clicking on FoxwoodsLive.com. 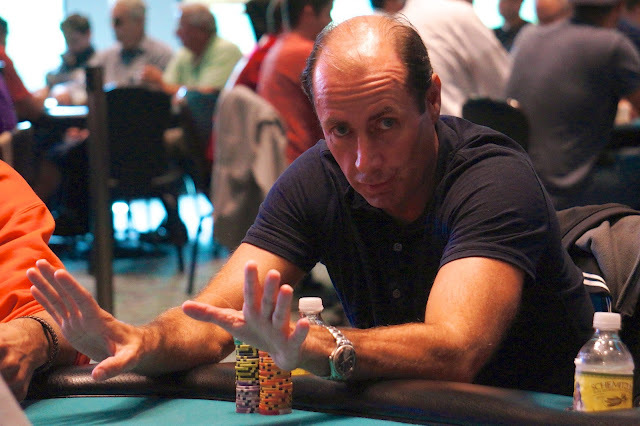 The Foxwoods Main Event has a 2012 November Niner in its midst. 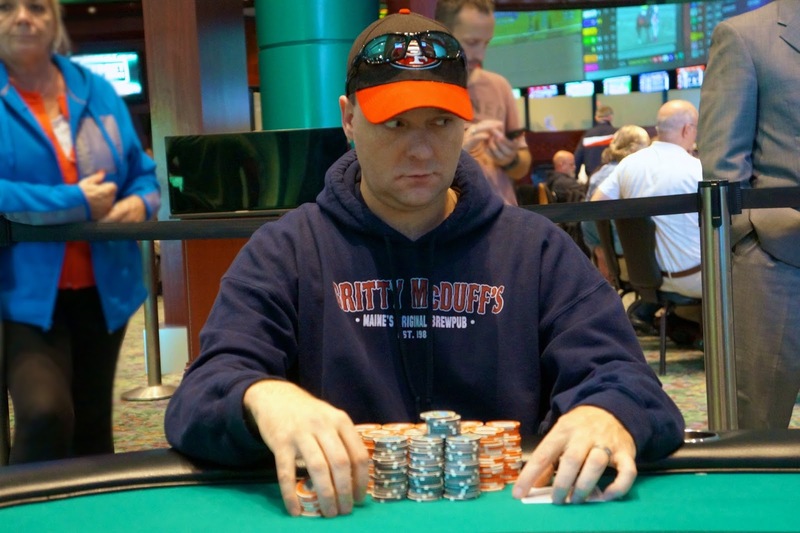 Michael Espositio has taken his seat in Flight A of the Circuit Main Event. 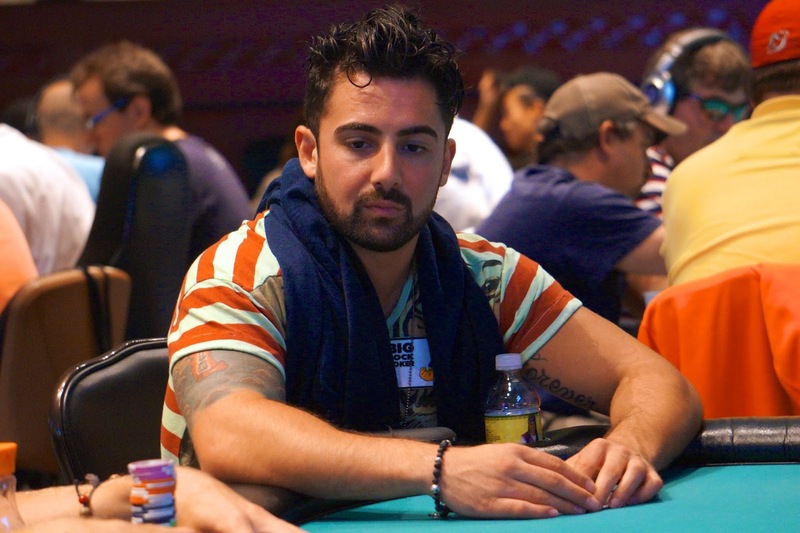 Esposito ended up finishing seventh in the 2012 WSOP Main Event for $1,285,040. Foxwoods is no stranger to hosting members of the November Nine. In 2010, Foxwoods played host to the November Nine in a special reunion during their February 2010 Mega Stack Challenge. 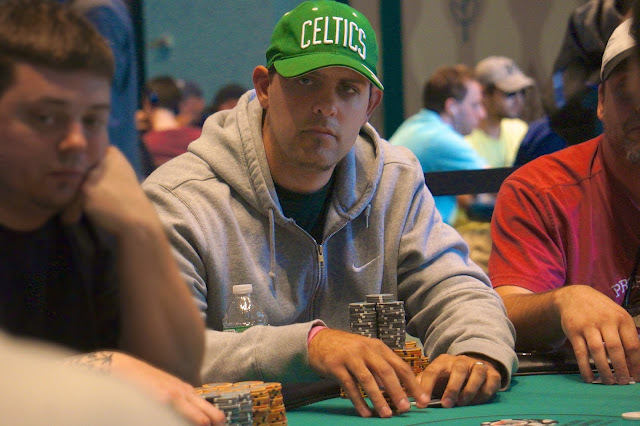 All nine members of the 2010 November Nine showed up, including eventual champion Jonathan Duhamel, Michael Mizrachi, Joseph Cheong and John Racener. Flight A of the Main Event Now Streaming Live! Flight A of the $1,675 Foxwoods Circuit Main Event is underway and streaming live. Foxwoods Circuit Main Event Now Underway! The $1,675 No-Limit Hold 'em Main Event is now underway at the Foxwoods Circuit series. Flight A kicks off at now while Flight B will start up at 5pm. You may enter either Flight or both if you are eliminated from Flight A. Players will start with 20,000 in chips and the first 15 levels of play are 40 minutes in length. Levels are then 60 minutes through 25. After that, all levels will be 75 minutes long. Play in Flights A and B will be 12 levels. 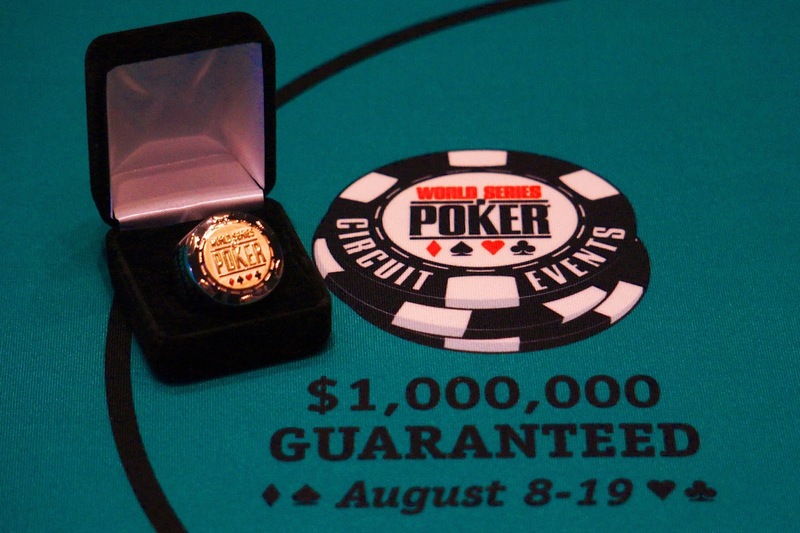 In addition to the Circuit Main Event Ring and a seat to the WSOP National Championship, this event features a $500,000 guaranteed prize pool. Be sure to stay tuned for all of the updates from the WSOP Circuit Main Event. Congratulations to Ari Engel, winner of the $580 No-Limit Hold 'em Event 9 at the Foxwoods Circuit series. This is Ari Engel's sixth Circuit Ring, putting him tied with Alex Masek and one behind Chris Reslock. 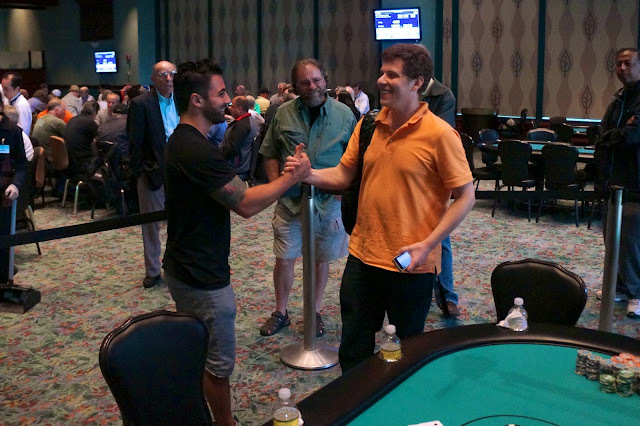 In the $580 No-Limit Hold 'em Event 9, play is now heads-up betweet Ari Engel and Aaron Massey. The two are on a short break before play resumes. Engel is going for his sixth Circuit Ring while Massey is looking to secure his third. You can watch the two battle it out on the Foxwoods Live Stream by clicking here. There are now only four players remaining in the $580 No-Limit Hold 'em Event 9. The blinds are currently 10,000-20,000 with a 3,000 ante. 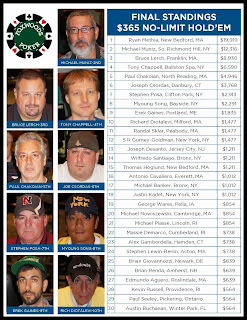 Ryan Methia currently holds the Foxwoods Casino Champion points lead with 72.5 points. However, Christopher Rizzo is looking to take over that position. Rizzo currently has 37.5 points by virtue of his second place finish in Event #4, the $365 No-Limit Hold 'em. 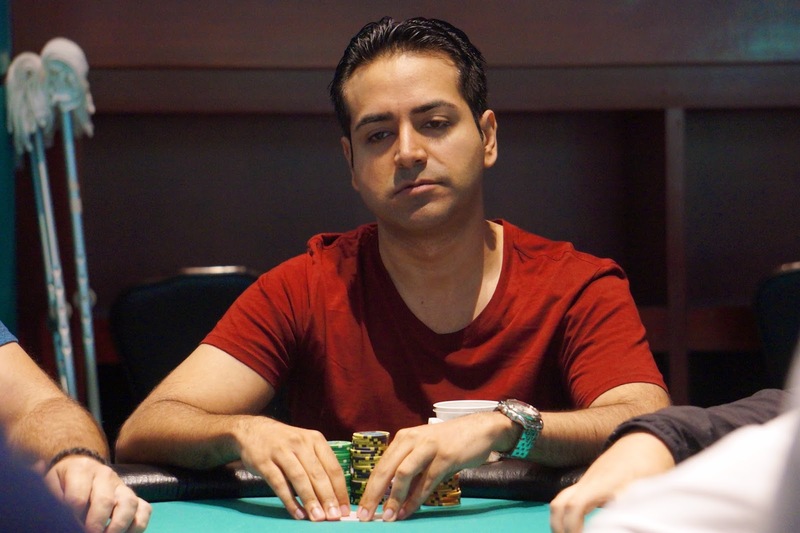 With only five players left in the $580 No-Limit Hold 'em event, Rizzo needs a 1st or 2nd place finish to take over the points lead from Methia. 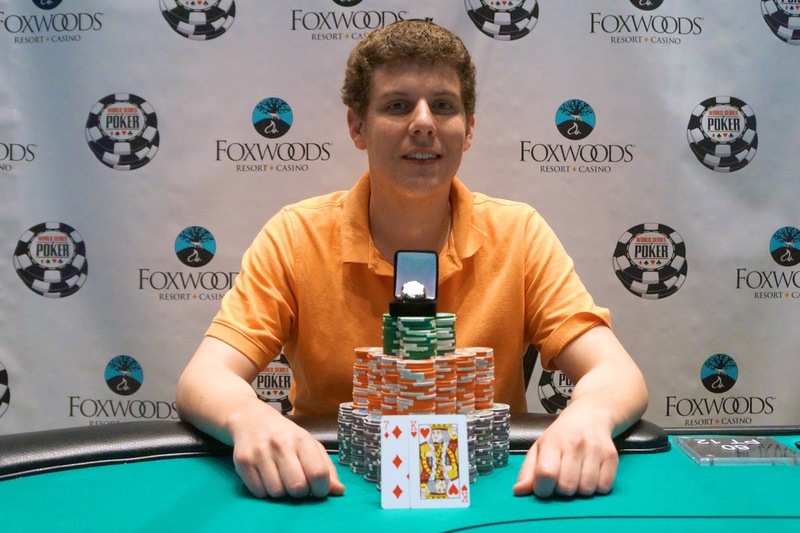 Ari Engel has made the final table of the $580 NO-Limit Hold ‘em event at the Foxwoods Circuit. Engel is going his sixth Circuit Ring. 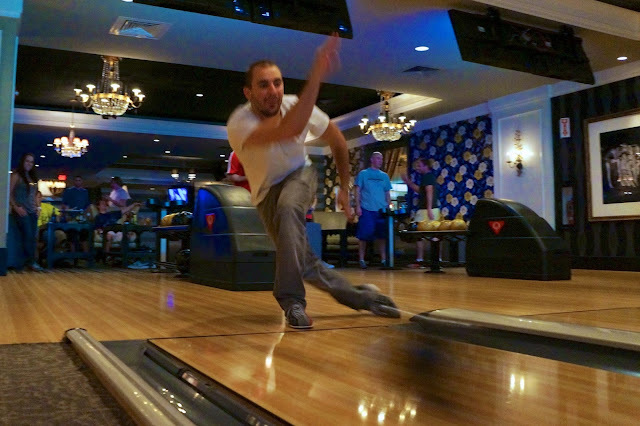 You can watch Engel go for the victory on the FoxwoodsLive.com. Day 2 of the $580 No-Limit Hold 'em event is now underway. Of the 235 players that started the Day 1, only ten remain. You can watch the live stream at FoxwoodsLive.com. Friday at the Foxwoods Circuit is underway with the start of the $250 Seniors event. While not a Ring event, there are already over 300 players in the field. At 1pm, Day 2 of the $580 gets back underway with one of the most stacked final tables we have seen this series. Five-time Circuit Ring winner Ari Engel comes in second in chips while two-time Circuit Ring winner Aaron Massey is third. Don't forget that tomorrow marks the start of the $1,675 Foxwoods Circuit Main Event. There are two flights tomorrow, at 11am and 5pm. There is a $500,000 guaranteed prize pool on this event. With only 18 players remaining in the $580 No-Limit Hold ‘em Six-Max event, the money bubble has burst. All players are now guaranteed at least $1,012 with $21,891 for first place. 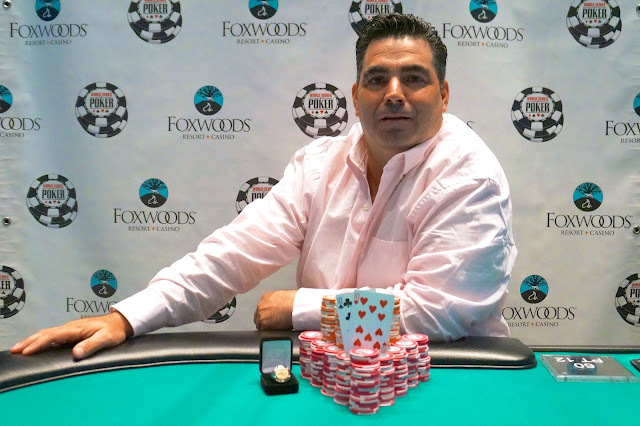 Congratulations to Ryan Methia, winner of the $365 No-Limit Hold 'em event at the Foxwoods Circuit Series. 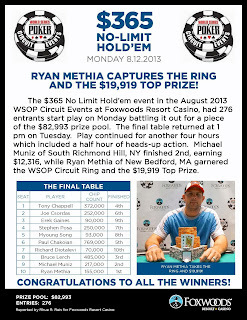 Ryan bested a field of 276 players to win his first Circuit Ring and $19,919. 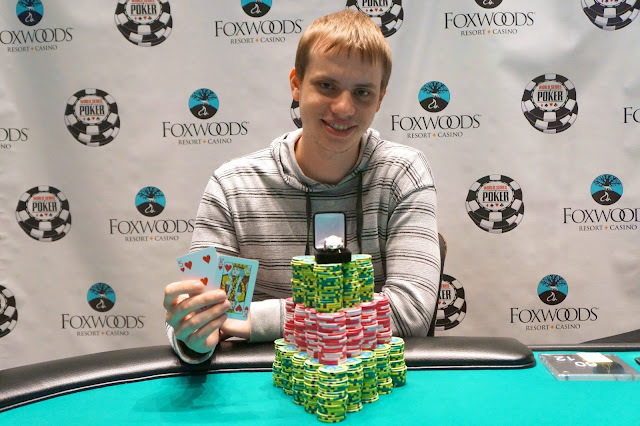 With his win, Ryan takes over the Foxwoods Casino Champion points race. 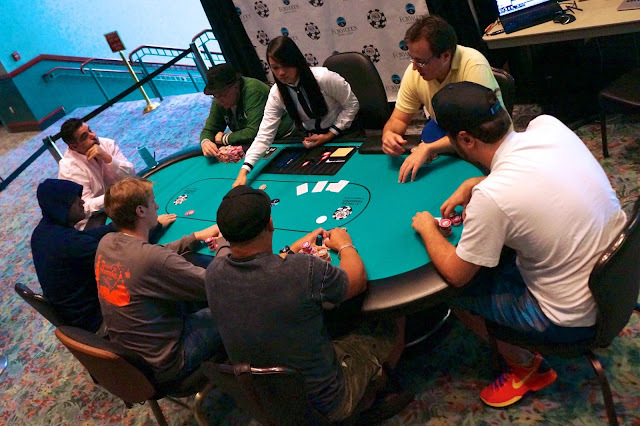 The seventh event at the WSOP Circuit, the $580 No-Limit Hold 'em Six-Max, drew 155 players. Day 2 of the $365 No-Limit Hold 'em Underway! The final ten players in the $365 No-Limit Hold 'em event have taken their seats and cards are in the air. Event 7 at the Foxwoods Circuit, the $580 No-Limit Hold 'em Six-Max, has kicked off on a rainy Tuesday. 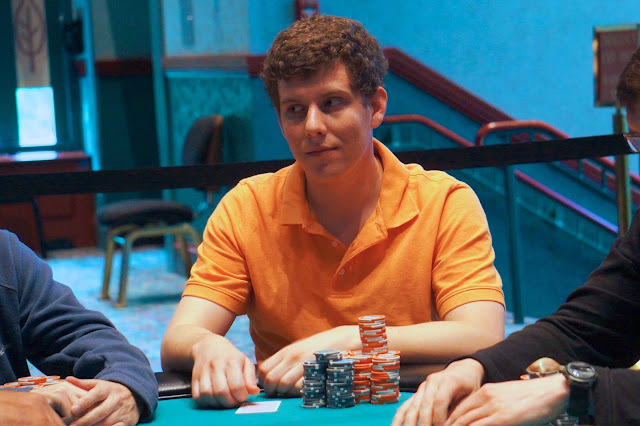 Players start with 12,000 in chips and the levels begin at 30 minutes. This event features a $40,000 guaranteed prize pool. 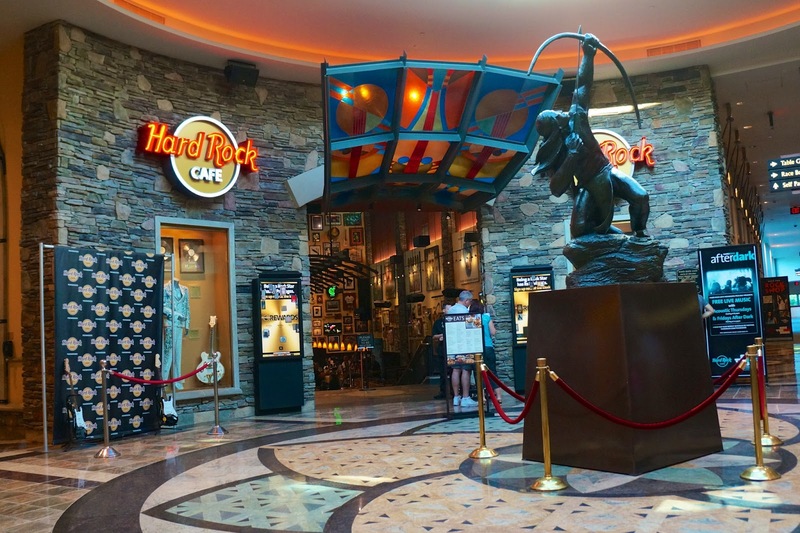 Day 2 of the $365 No-Limit Hold 'em event will get underway at 1pm. 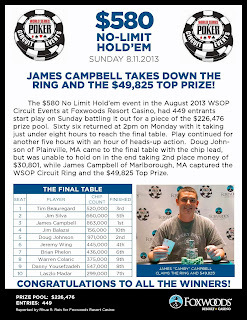 James Campbell Wins the $580 NLHE Re-entry Event! 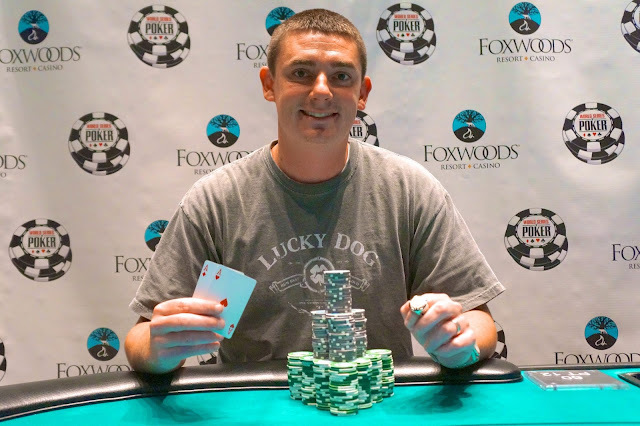 Congratulations to James Campbell, winner of the $580 No-Limit Hold 'em Re-entry event at the Foxwoods Circuit Series. Campbell takes home his first Circuit Ring along with $49,825.